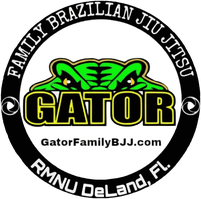 RMNU 2.0 - Gator Family Brazilian Jiu-Jitsu, DeLand Fl. The Gator Family has a standing invitation for all registered adults to train at RMNU Headquarters on the first Saturday of the month. On 8/4/18 I had the opportunity to train with Professor Robson and the RMNU Team. We all enjoyed great instruction from Professor Robson as always. Followed by some competitive rolls. Everyone stayed for open mat to roll, get tips, and catch up with friends. The space has been under construction for a few weeks. Walls were removed to allow for more mat space. The result is one huge area to train. I really liked the new logos on the walls. Very professional and modern. Can hardly wait for the 2018 Camp!! !